the statement present in Baraheen-e-Qati’ah which was written in 1303 AH. Mawlana Khaleel Ahmed wrote it and Mawlana Rashid Ahmed not only endorsed it , infact he provided his inputs also in this book. This book contains a paragraph which compares the blessed knowledge of Rasulullah sallallahu ‘alaihi wasallam with that of the accursed Iblis (satan). The leaned Deobandi writer says that Mawlana Khaleel Ahmed never compared the knowledge of prophet with knowledge of angle of death and satan. His point is that , this book “Baraheen-e-Qati’ah , was written in refutation to another book”Anwaar – e Saatiah” by Mawlana Abdus sami Rampuri. (Every one knows that Mawlana Abdus sami Rampuri was a disciple and Khalifah of Imamdullah Makki. The Deobandi author is not correct when he says that Mawlana Abdus sami was a follower of Imam Ahmed Raza khan RH ). The Deobandi writer says that Mawlana Abdus sami wrote two things. First, that prophet had the self knowledge ( dhati) of everything and second , the angel of death and satan know the unseen ( ghayb) and since prophet has higher status than satan and angel of death then the prophet must also have the unknowledge of the unseen ( ghyab). After mentioning this the author says that , it was only in refutation of these examples Mawlana Kahalal Ahmed wrote ‘ those “ statements in Baraheen-e-Qati’ah. Let us see what are “those” statements and how Deobandi writer has landed up in catch 22 situation! “The final result is: By pondering over the knowledge of the earth possessed by angel of death and satan , one should not use this analogy to prove that prophet (Sallallahu ‘alaihi wasallam) also had the similar knowledge, as there is no documentary evidence for this. Isn’t this belief (that prophet also had the knowledge of the unseen) a CLEAR SHIRK , and if not , then which part of Iman (belief) is it ? How much pain a Muslim gets in reading those lines cannot be realized by those whose hearts has been blackened due to their disrespect for prophet. Let this fact be known that NO where in his book Anwaar e saatiah has Mawlana Abdus sami has said that prophet had the Self ( dhati) knowledge . He said that the knowledge was given by Allah to His most beloved prophet . 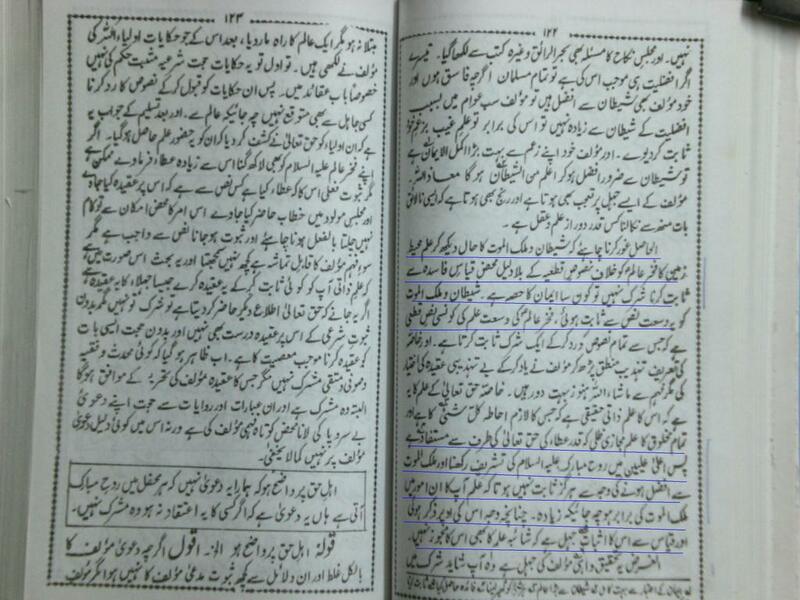 Deobandi writer is once again wrong in accusing Mawlana Sami of saying that prophet had self knowledge. But for the sake of argument , let me accept the Deobandi version of the story. 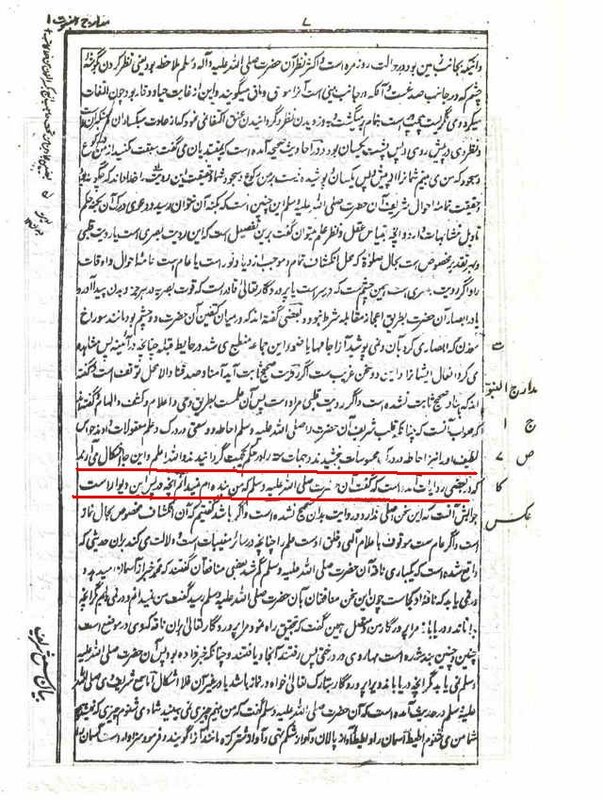 Deobandi version says that it was in Polemic ( Munazara) that Mawlana Khaleel Ahmed compared the knowledge of prophet with knowledge of satan and angel of death. The truth: Mawalna Abdus sami said that when Allah gives the knowledge of the unseen to his other creations like angle of death then prophet being the most beloved , how can some one say that Allah did not give the knowledge of unseen to prophet. Mawlana Khaleel said that to have a belief that prophet had the knowledge of unseen is SHIRK. Deobandi version: Mawlan Abdus sami said , Prophet had the self Knowledge of the unseen. The Truth: As per the Deobandi writer, the whole context in Baraheen-e-Qati’ah is a refutation. So what refutation did Mawlana Khaleel provided? He said” the knowledge of the unseen ( ghyab) possessed by angle of death and satan has been proved by quran and sunnah”. The fact is ,there is NO source from Quran and Sunnah which says that angle of death has SELF knowledge. All the text says they have knowledge given to them by Allah. And if not then , we have to accept that Mawlana meant that angel of death and satan have knowledge given to them by Allah. (This is clear that in his refutation Mawlana Khaleel was talking about “ given knowledge ( atai) and not ‘self knowledge ‘( dhati). And from this simple analogy it is clear that Mawlana Abdus sami spoke about the knowledge given to prophet by Allah. The truth : Mawlana Abdus sami praised prophet when he said when lower creatures (with respect to prophet) like angel of death are given knowledge of unseen by Allah , then how can some one say Prophet is not given knowledge of unseen by Allah? It is clear Mawlana Khaleel was talking about the text from quran and sunnah which say that angel of death and satan have GIVEN knowledge of unseen from Allah. . He said , the knowledge given to angle of death and satan from Allah is proved from Quran and Sunnah, but if some one thinks that prophet also was given knowledge of the unseen from Allah , then IT IS SHIRK! Not only did Mawlana Khaleel Ahmed compared the knowledge of angle of death with prophet’s knowledge, he infact lowered the knowledge and status of prophet. As per Mawlana Khaleel Ahmed to accept that Allah gave knowledge of unseen to angel of death is permitted, but to think that prophet was also given the knowledge of unseen from Allah is SHIRK! All these argument which the Deobandi writer has brought is from the book “ As shahbus saqib” written by Deobandi Scholar Mawlana Huseein Tandvee. It seems the learned writer is not aware that this book contaning wrong logic and wrong tawil was refuted by many Ahlus sunnah scholars of India. I am using one such book to reply to these claims! 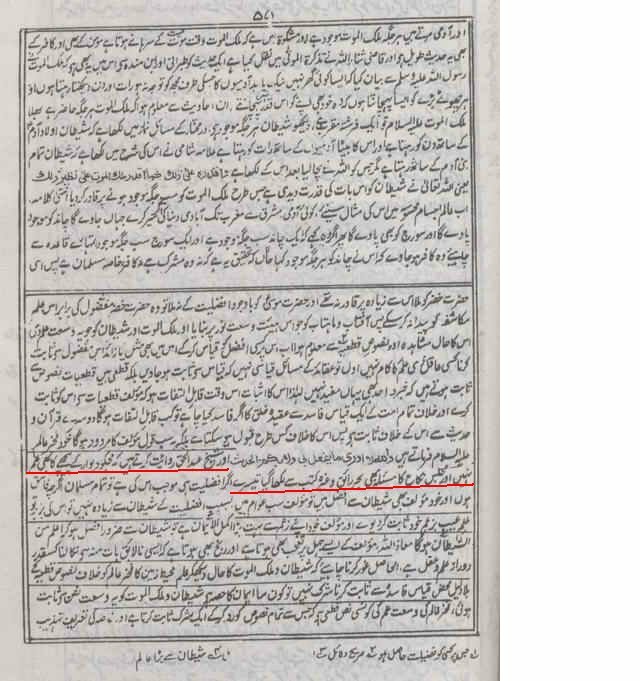 The learned Deobandi author then mentions the statement of Mawlana Khaleel ahmed which is present in Al Muhannad. A man commits a murder and later writes a book that killing is a sin. Will it help that man? Or say, in future he writes a book and accepts his crime, will that acceptance remove that murder charge from him? Then why is this Deobandi author even bringing this book Al Muhannad which was tailored to get fatwa from scholars of Makkah and Medina. “It is our ( deobandi) belief that any one who says that so and so has more knowledge then prophet , then such a person is KAFIR” . “ Hence , mere presence of the soul ( Ruh)of Rasul Allah ( sal allahu alai hi wa sallam) in Illiyeen and his being higher than angle of death does not mean that the knowledge of Rasul Allah ( sal allahu alai hi wa sallam) is higher than or even equal to the knowledge of angel of death in these fields (Bariheen qatiya). 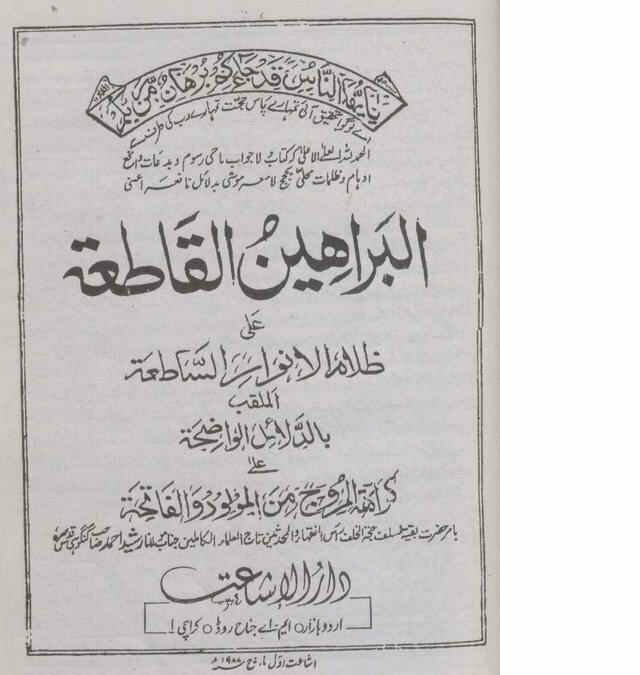 Kindly find the scans from Barhaeen Qatiya written by Mawlana Khaleel Ahmed and Mawlana Rashid Ahmed. “The final result is: By pondering over the knowledge of the earth possessed by angel of death and satan, one should not use this analogy to prove that prophet (Sallallahu ‘alaihi wasallam) also had the similar knowledge, as there is no documentary evidence for this. Isn’t this belief (that prophet also had the knowledge of the unseen) a CLEAR SHIRK , and if not , then which part of Iman (belief) is it ? At this point a doubt is often put forward about a narration that prophet said that he was not aware of what was behind the wall. The answer to this doubt is that this narration is a lie and there is no truth in it . Dont just see the fabrications by these Deobandis , but THINK WHY WAS this fabrication done ! ! Dont just see the fabrications by these Deobandis , but THINK WHY WAS this fabrication done ! There is no use for deobandis to quote Al Muhannad, as no deobandi agrees to talk on that book! See this fabrication which Imam e rabbani of the deobandis did ! He quotes a mawdu hadith and the scholar wom he quotes ( Imam Abdul Haq Muhaddith al dehalvi ) said” there is no basis for this hadith”. But the deobandi scholar did not quote this part ! Readers will be shocked to read this incidence after they have read the above incidence.